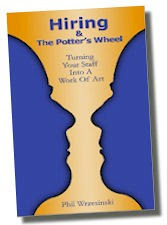 Another excerpt from the highly acclaimed book "Hiring and the Potter's Wheel: Turning Your Staff Into a Work of Art"
“So, how did the conference go?” Mary began. Mary almost didn’t know where to begin. “The pottery is great. I love it. I think I may have found a new hobby. I can’t thank you enough. And as for business, since we last met, I have learned three distinct lessons.” Mary pulled out some notes she had been taking. "First, before I can start throwing, I mean training, I have to make sure everyone is centered, that they are starting from the same point. Everyone has to be on the same page. That pretty much goes hand in hand with the earlier lesson of getting out the impurities, the air bubbles. I’ve already developed a clear set of guidelines and expectations, and also a list of bad habits to watch for and weed out, if necessary. But no matter what their previous experience, everyone will start from the same point in their training. That way I’ll be sure not leave anything out. “Second, once the throwing, oops, I mean training, begins, I have to remember to use a gentle hand, lots of positive encouragement. There’s the old saying, 'you get more flies with honey than with vinegar.' The same is true in teaching. The more positive gentle words, the more likely the student will listen and learn. “That was tough for me, I mean in the pottery. I kept pushing too hard and watching my bowl flop over like it was sick. It reminded me of how I feel when someone yells at me or pushes too hard. Patience and gentleness are definitely the keys. I wrote myself a sticky note on top of my computer to remind me to praise everything done right during the training to help encourage that behavior. “But wait, as I think about it, you were never gentle with me, Dr. Scott. You always pushed me hard. You and your, ‘you can do better,’ mantra,” Mary added with a slight sarcastic twinge. “No, I guess not,” Mary replied wistfully. “You’re absolutely right on this, Mary,” Dr. Scott continued. “Pushing too hard never works. But you have to find the right pressure to get the most out of your clay, and your trainee. If you don’t push at all, nothing gets formed. “Kind of how your clay is growing stronger as it hardens?” Dr. Scott asked. “Exactly!” Mary exclaimed. “Once the training is complete, I’m going to come up with a safe way for my new sales reps to use their skills. But Peter said something curious just as we left. He mentioned that our bowls, although hard, would be quite fragile once dried. I think I’ve got a little more to learn about this step and the steps following.